The new CouesWhitetail.com uses WordPress as a content management system. WordPress is software that makes it easy to publish content on the Internet. 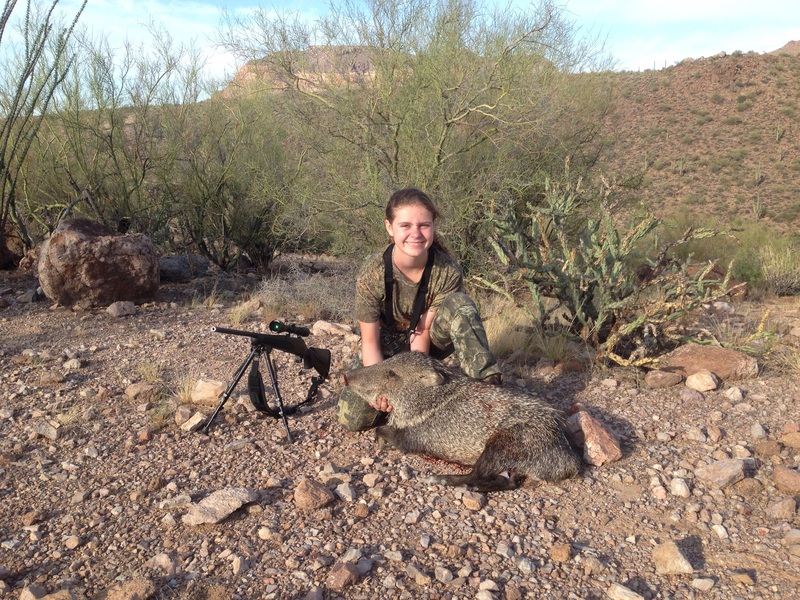 The new site allows users to login and upload their own content, including photos, hunt stories, and more, as well as to comment on the articles, photos, and stories of fellow CW.com community users. If you’re already a member of the discussion forum, you already have a user account set up at cw.com. To access it, first log in to the forum. 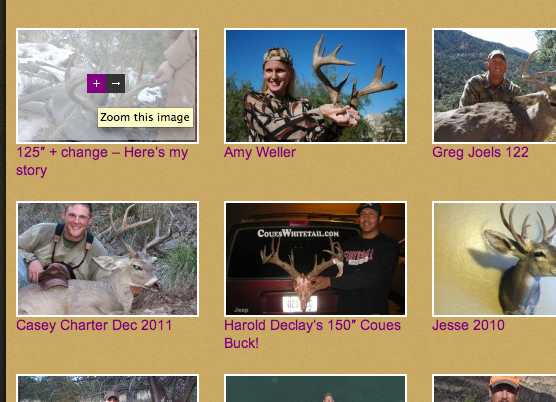 Next, navigate to www.coueswhitetail.com, and select the “Log in” link in the main navigation bar. Simply sign in using the same user name and password you use to access the forum. The CW.com Log In and Register links. If you’re not currently a member of the forum, register for an account by navigating to the same “Log in” link in the menu navigation. 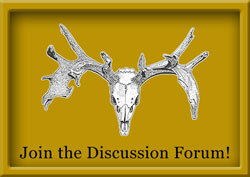 Once registered, you will also have a user account for the forum, and can add to the discussions there as well. the Log In prompt. Use your forum log in credentials. 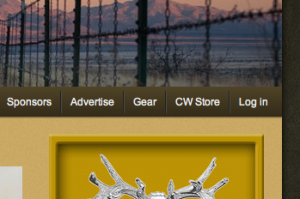 We tried to keep the design recognizable from the old CouesWhitetail.com, with the major differences being how content on the site is organized and presented. You’ll notice the navigation is now a horizontal bar beneath the header image. The site sponsor badges are now located along the left sidebar. And the right sidebar is full of smaller information chunks, links, and navigation pathways. There’s a large featured content slider at the top of the page giving you an introduction to the most important current posts. Beneath the current posts is a two-column list of the most recent posts added to the main site, followed by a brief overview of the website. Beneath the overview, you’ll find the latest posts organized by category. Perhaps the biggest advantage of the new website is how much easier it is to find and navigate to specific content. In addition to the main navigation bar, content can also be accessed through the site’s search function, or even more powerfully, through browsing content tags. Tags are words authors use to quickly describe, or summarize what can be found in what they’ve written. 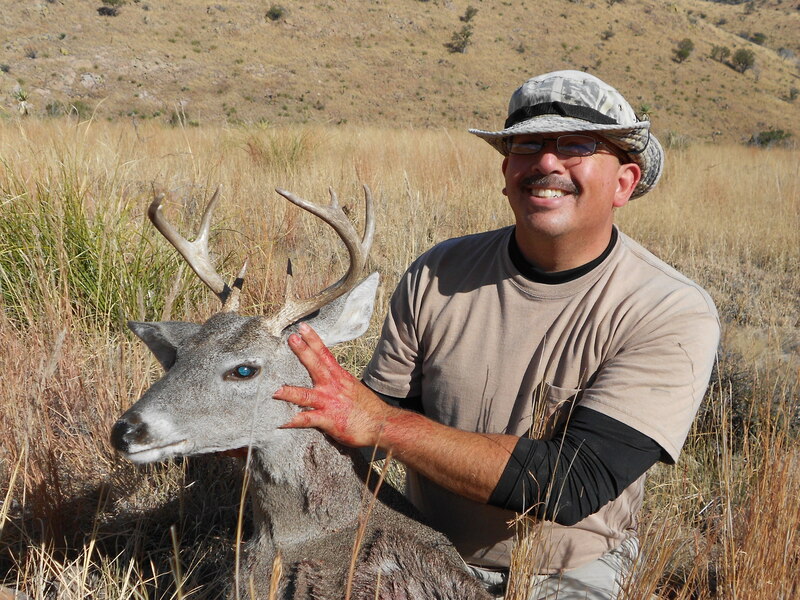 We’ve tagged most of the current posts primarily with information about the units, score of the deer, or the person hunting. For example, if you drew a unit 33 tag and want to find all of the posts about deer in unit 33, all you have to do is click the 33 tag. 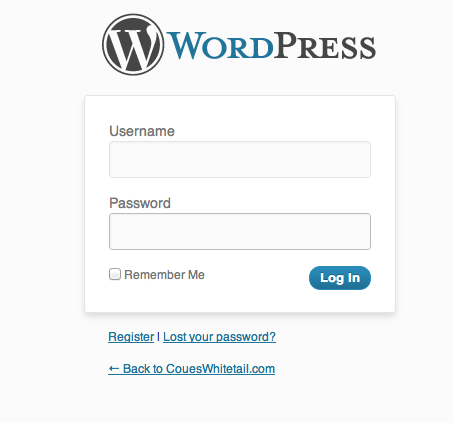 Note that this only pulls information from the main WordPress site, and not from the forum. Content on the forum remains quite separate, so should be searched there as well. 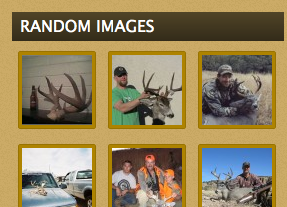 Another neat feature of the new website is the ability to randomly pull and display images from the website. Many of these were uploaded years ago, and may have gone unnoticed by many of you. You’ll remember the old photo galleries were quite cumbersome and difficult to navigate. On the new CW.com, the image galleries are organized by type, and displayed slightly differently. You can now click on the plus sign in the middle of the first image (it shows up when you hover your mouse over the picture), and cycle through the rest of them without having navigate to new pages. 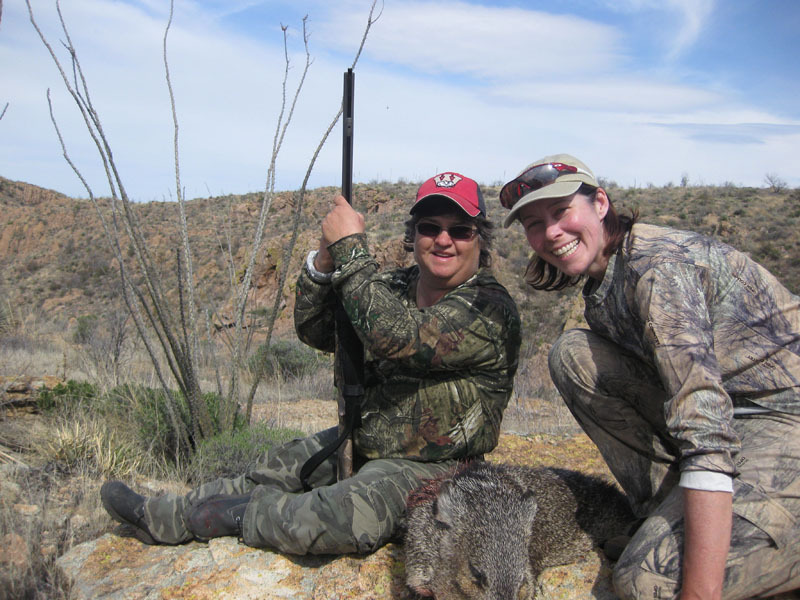 Further, many of these images contain information or stories about the animal and the hunt. 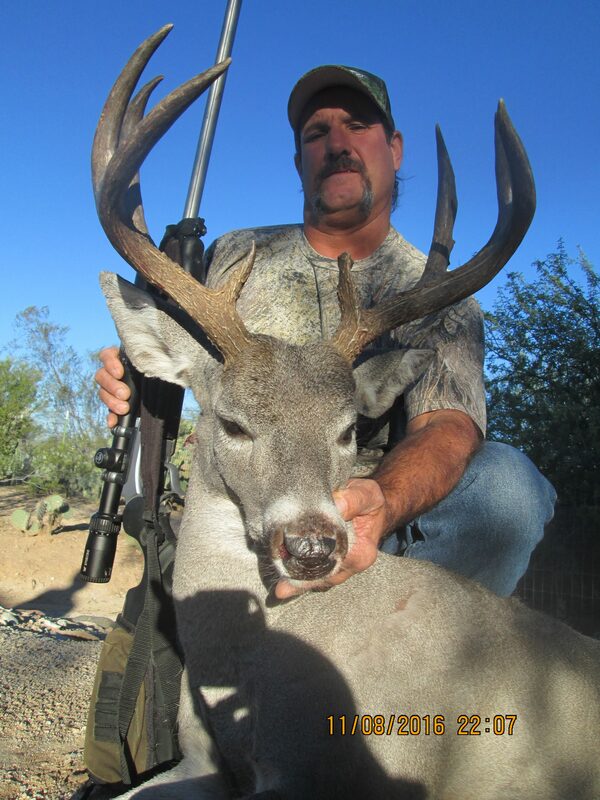 To learn more about any particular image, or to see more images of the same deer, click through to the image’s post by clicking on either the arrow in the center of the image, or the title below the picture. Select the “+” option to enlarge the photo and navigate between other pictures on the page, or the -> to visit the photo’s post to learn more about it. 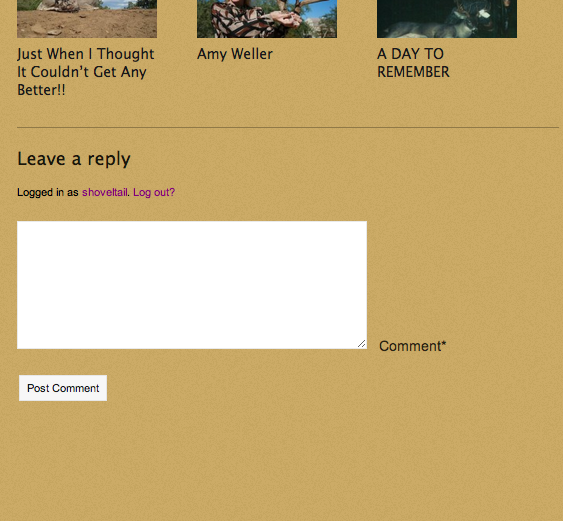 To leave a comment about any story or photo, simply enter your text in the space below the post and click submit. Comments are nested, meaning that they work similar to “quoting” in the discussion forum by showing up indented and beneath the comment they are replying to. 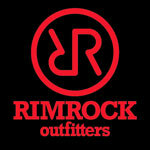 Leave a comment by typing your response, and selecting the “Post Comment” button. Your comments will enter a moderation queue to ensure they are appropriate for the site. 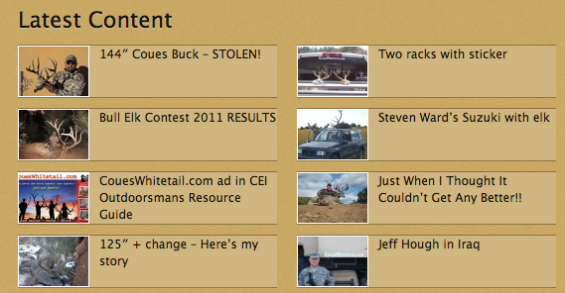 As mentioned earlier, every member now has the ability to write articles or stories to be posted on the new CouesWhitetail.com. WordPress refers to these articles/stories as posts. 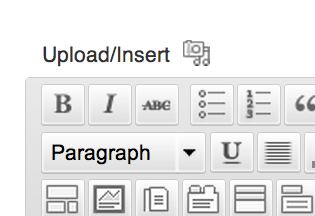 To write a new post, simply navigate to the top of your browser window and select the ‘+ New’ link in the menu. Unless you’re a CW.com editor, “New Post” will be your only option, and WordPress will open a new page with a text editor in the center of the page. The first thing to do is give your post a title. Then in the editor below, type your article or story. You have the option to use the editor as a word processor (visual), or as an HTML editor for those who wish to write in HTML. Add a title, then type away. We recommend you write any long posts in software like Microsoft Word, or a basic text editor, and copy and paste into the window. To add pictures to your posts, ensure the cursor is where you want the photo to appear inline with the text, and select the “Add Media” button icon from the top of the editor. A smaller window will pop up and ask you to upload your media. Simply navigate to the photos you wish to add, and select upload. 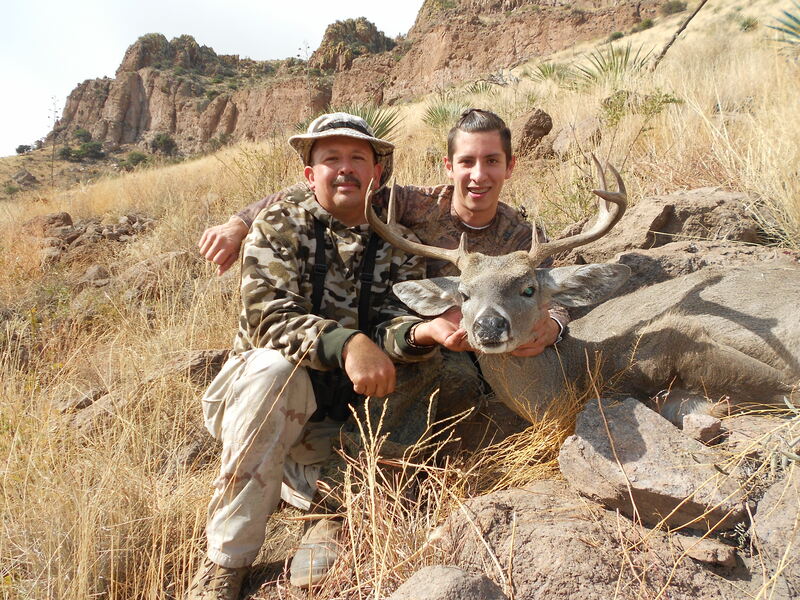 Once they’re loaded to the site, you’ll have the option to give them a new title, add alternative text (this is what Google reads when it indexes the site, and also gives a description of the image to anyone visiting the site with a screen reader, so choose these wisely, and please give back to Amanda by at minimum entering “Coues deer”). Next you can add a caption. Captions show up in the posts directly below the image, and should be used to explain what the photo is or is about. You can add to the description box if you’d like, but it’s not really necessary. 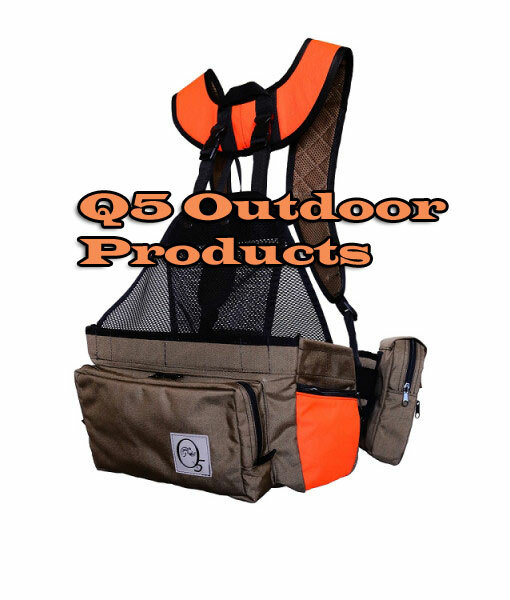 Next, select how you’d like the image to display inline with the text. We recommend you use the center option. 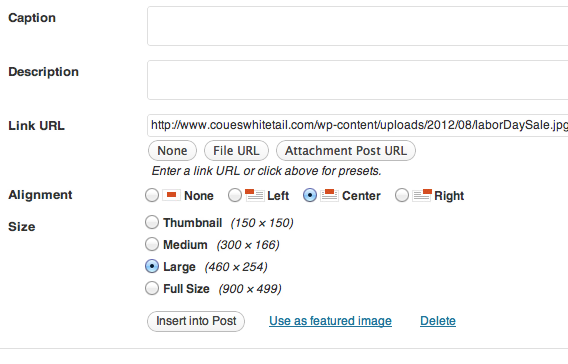 And ensure that if your photo is larger than 600px wide, you use the Large size option. 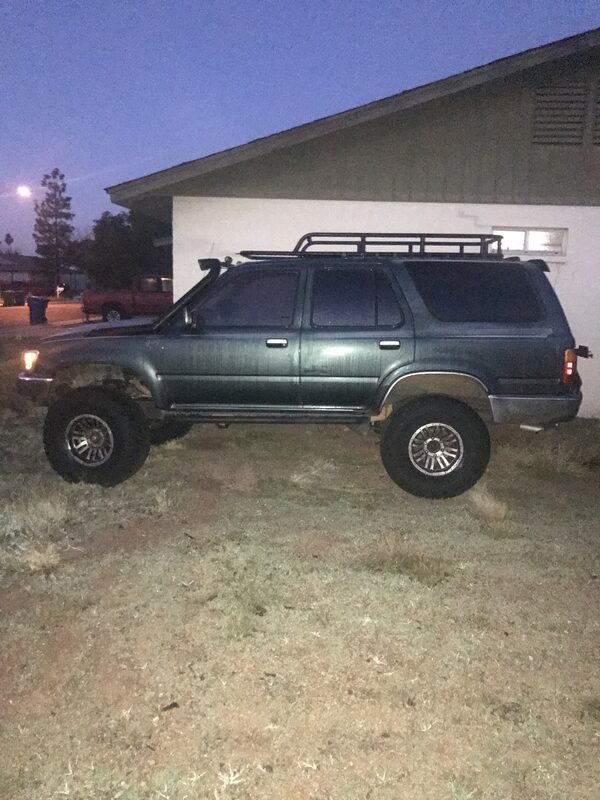 Before you select insert into text, decide which image you’d like to show up as a thumbnail for your post, and select the “Use as Featured Image” option below. Then go ahead and select Insert. If you’re done typing your post, choose from the available categories so the site knows your post should belong. Posts can have more than one category. Next add tags about what’s contained within the post. 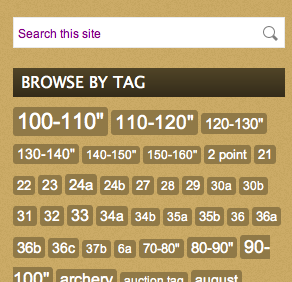 The site already has a list of many current tags, and they will pop up for you to choose if you being typing them. select an appropriate category, then summarize what can be found in your posts using Tags. Select publish when done. 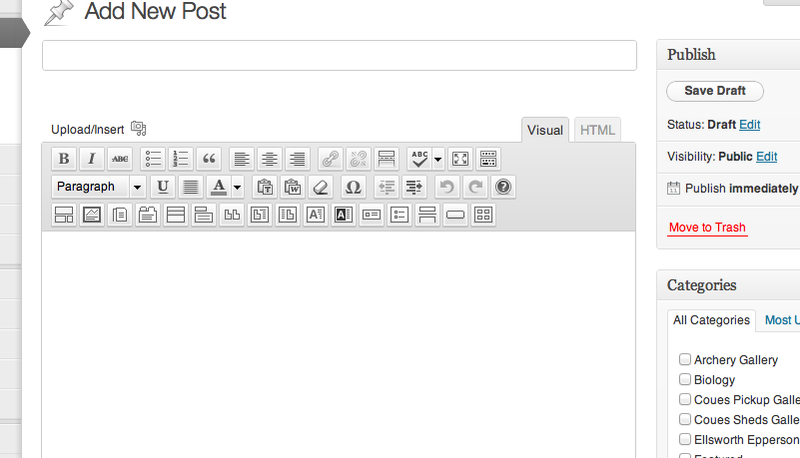 Once you’ve categorized and tagged your post appropriately, click the publish button. Your post will go into a moderation queue, where a CW.com editor will review your post and publish it to the website. We thank you for your participation and addition to the CW.com website. 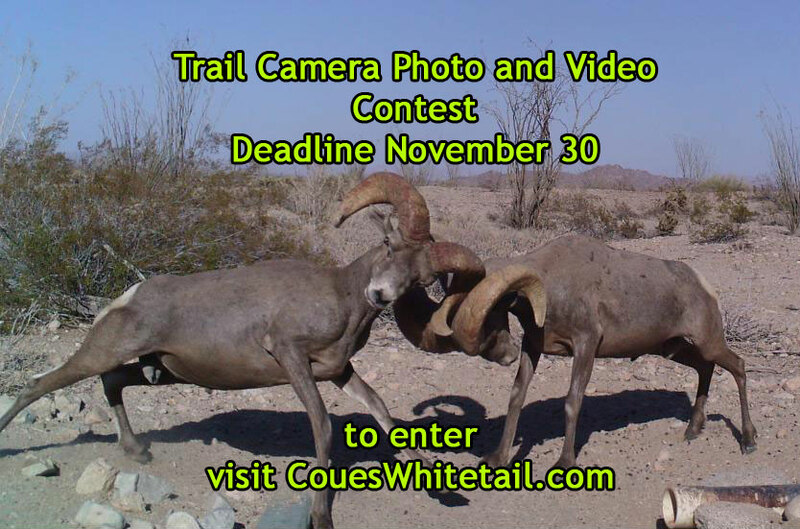 It’s the users and the community that make CouesWhitetail.com one of the best hunting communities on the Internet today.